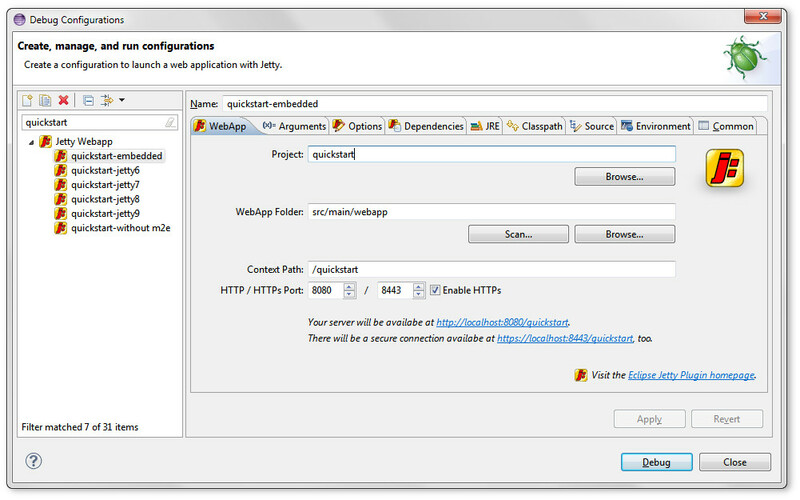 Eclipse Jetty Integration provides a launch configuration for launching Jetty server out of the Eclipse IDE (4.x, 3.4 and up). Currently supported versions of Jetty are 7.x, 8.x and 9.x. You can use either the bundled Jetty 8 or any other manually installed one. This plugin is released under the Apache 2.0 license (http://www.apache.org/licenses/LICENSE-2.0.txt). For more information on installation see Installation. For more information on running see Getting Started. The Eclipse Jetty Plugin is hosted on GitHub and is maintained by Christian Köberl and Manfred Hantschel. It's primary goal, is to provide a stable and consistent launch environment for large projects and development teams (reducing configuration needs per developer to a minimum). It is based on the original Jetty Launcher by Geoffrey Longman (base for the well known Run Jetty Run plugin, too), although not a lot of the code base has survived.